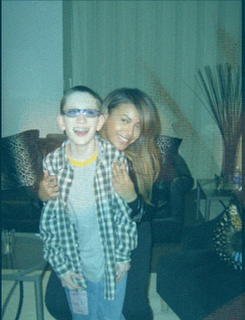 “The first time I met Timmy Kelly was in 2007, backstage at the Grammys. He was only 13 and he touched my heart with his voice and his love of music and life. He’s now 18 and he’s graduated high school — I’m so proud of him! Timmy was born blind, and with cerebral palsy. But this never slowed him down — he has proven to everyone, that anything is possible if you believe in yourself and work hard. In Philadelphia, he’s known as the good luck charm to the Eagles and whenever he sings the national anthem before a game they always win. His strength and determination is an inspiration. Timmy was just accepted to Temple University’s Boyer College of Music and Dance. This entry was posted in Celebs and tagged Beyonce, Blind, fans, Pens, Timmy, Tumblr, Writes. Bookmark the permalink.